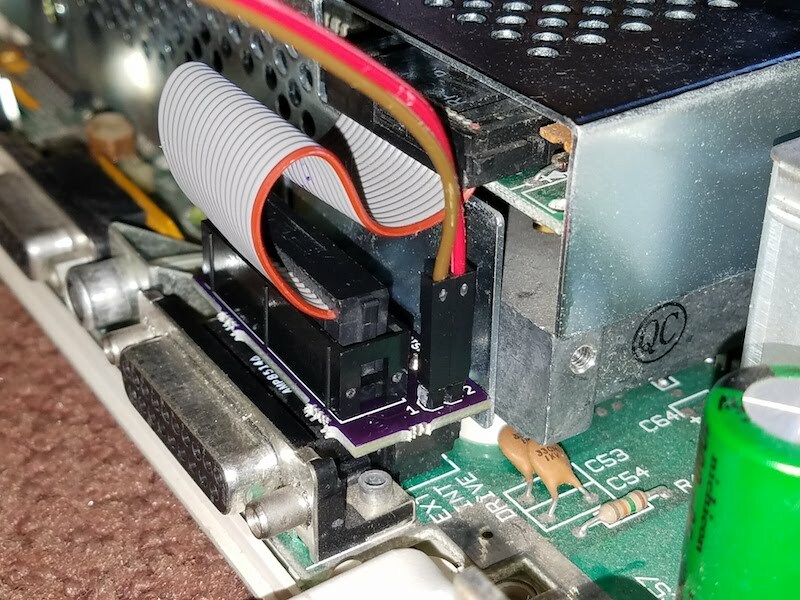 The Drive Switcher isn’t required, but it makes everything more convenient for a Floppy Emu on the Apple IIc, when emulating a 5.25 inch floppy disk drive. 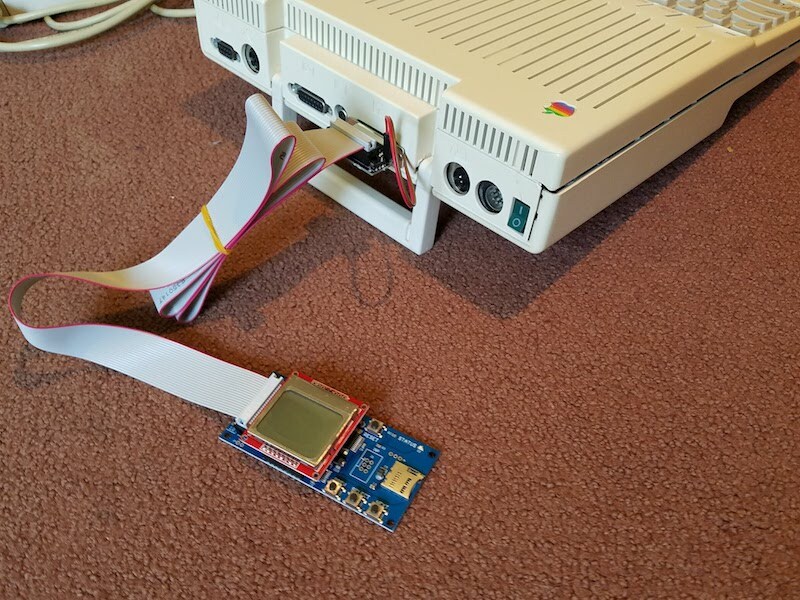 Before now, the best option was to disconnect the internal floppy drive, and connect the Floppy Emu to Apple IIc the motherboard. While this worked fine for the Floppy Emu, it meant IIc owners forfeited their ability to use the internal drive. With the introduction of the Drive Switcher, IIc owners now have the best of both options. The Apple IIc’s boot drive limitation only applies to an external 5.25 inch floppy drive. An external Unidisk 3.5 drive or Smartport hard drive (like Floppy Emu when configured for Smartport hard disk emulation mode) can boot the Apple IIc without the aid of the Disk Switcher, or with the Disk Switcher when in its normal mode. Both parts of the Drive Switcher must be installed and connected. 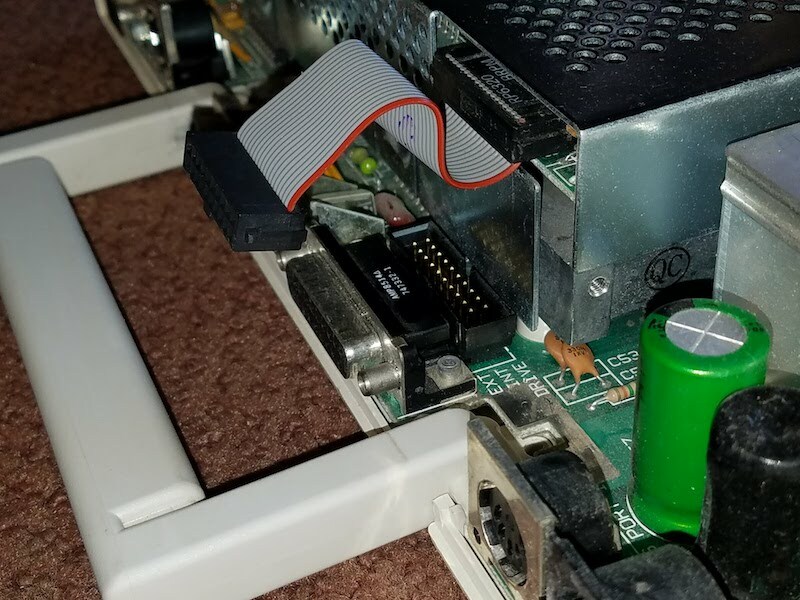 If you try to use one part without the other, or without the wires that connect the two parts, then neither the internal drive nor the external Floppy Emu drive will work correctly. Step 1 is to remove the top panel from the Apple IIc. Remove the six screws from the bottom of the IIc case, and use a blunt tool to bend the tab that holds together the bottom and top panels. This tab is located below the N key on the keyboard. Then separate the top and bottom panels. 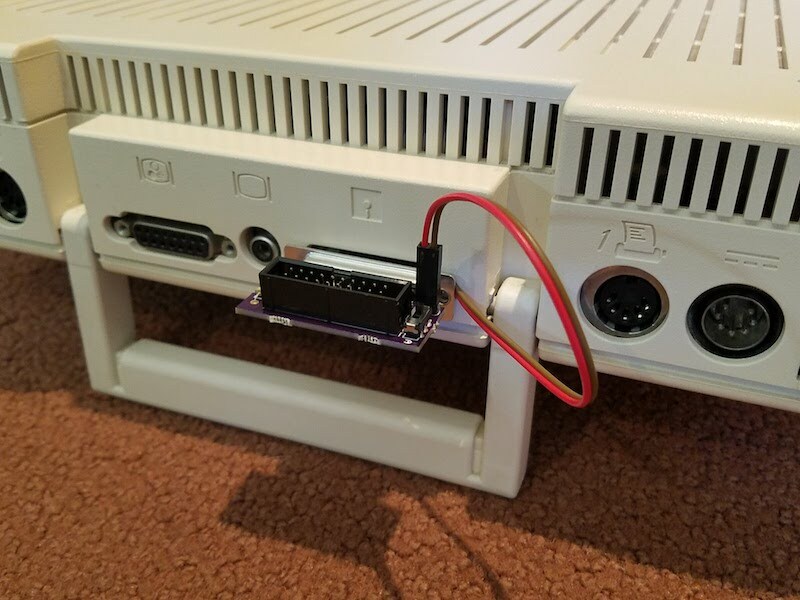 See this iFixit guide for more details on opening the Apple IIc case. 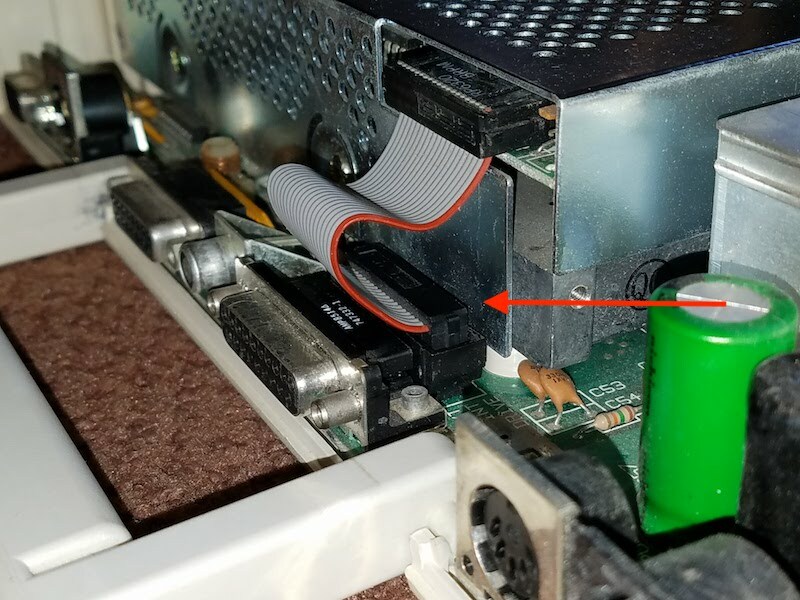 Locate the ribbon cable that connects the internal floppy drive to the motherboard. Be certain the signal tap board is centered correctly over the 2 x 10 male connector on the motherboard! When plugging the signal tap into the motherboard, verify that all 20 pins are aligned with the female connector on the bottom of the signal tap. Do not leave any pins uncovered on the left or right sides. 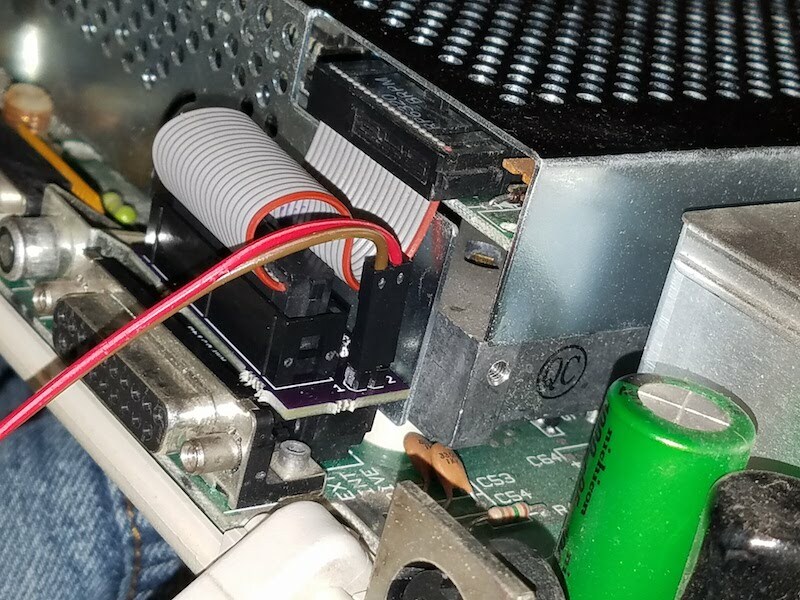 Misalignment will damage your internal drive, Floppy Emu, and IIc. Now connect the ribbon cable to the top of the signal tap. Also connect one end of each jumper wire to one of the signal tap’s male header pins. Here I chose to connect the brown wire to pin 1, and the red wire to pin 2. I’ll need to make the same choice later for the external jumper wire connections. Now it’s time to close the case. First, set the top panel loosely on the IIc, and thread the jumper wires through an opening in the rear of the case. 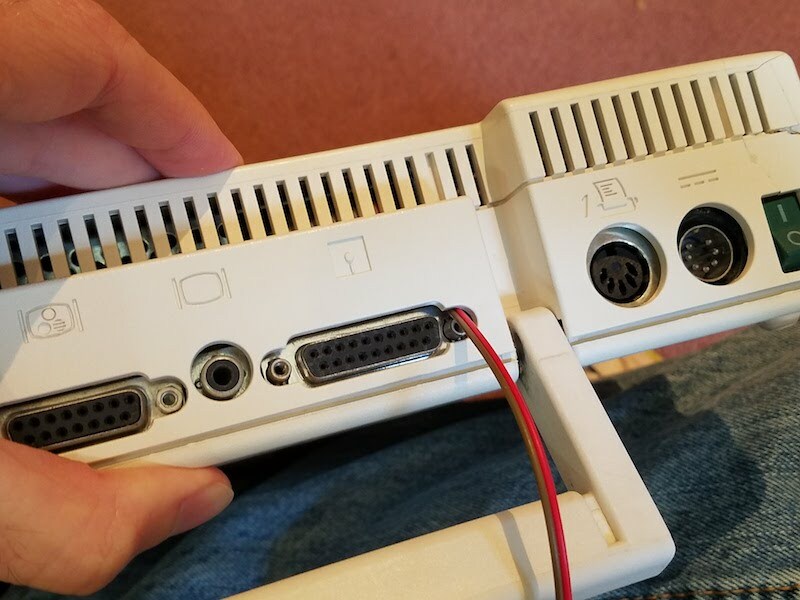 In the photo, the wires are threaded through the opening for the DB19 disk connector, but I prefer using the opening for the DB15 RGB monitor connector (new photo coming soon). 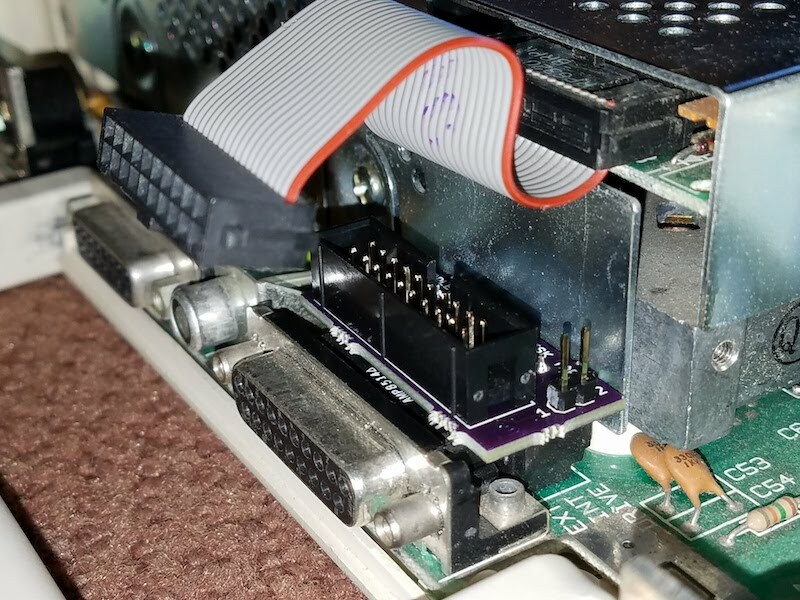 Or use the opening for the printer port or the composite video connector. 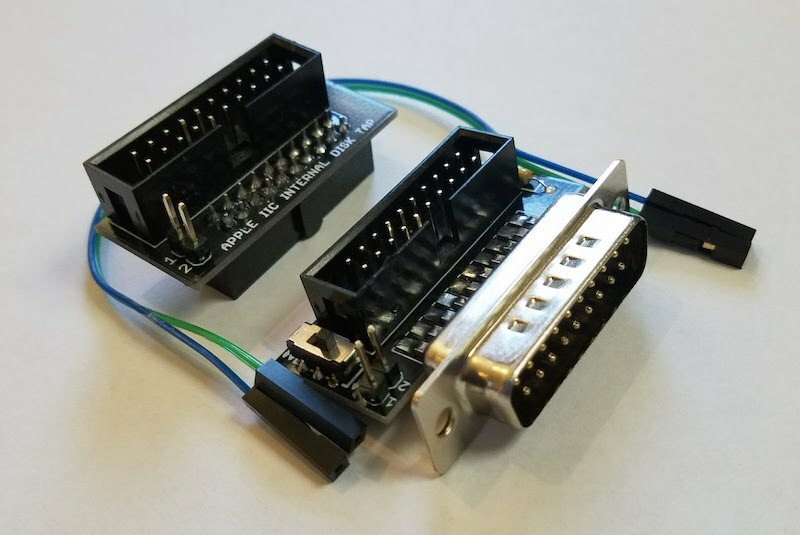 Connect the jumper wires to the 2-pin male header on the switched DB19 adapter, remembering to use the same color-to-pin mapping as before. 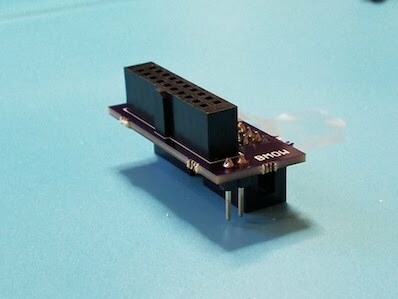 Pin 1 of the internal board connects to pin 1 of the external board, and pin 2 connects to pin 2. Then plug the DB19 adapter into the Apple IIc’s external disk port. 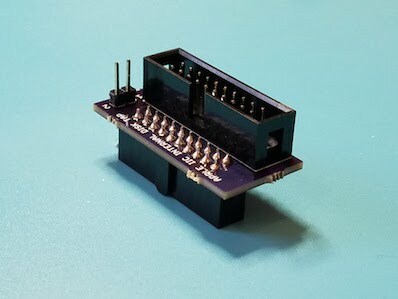 It will replace the standard DB19 adapter that’s included with the Floppy Emu. 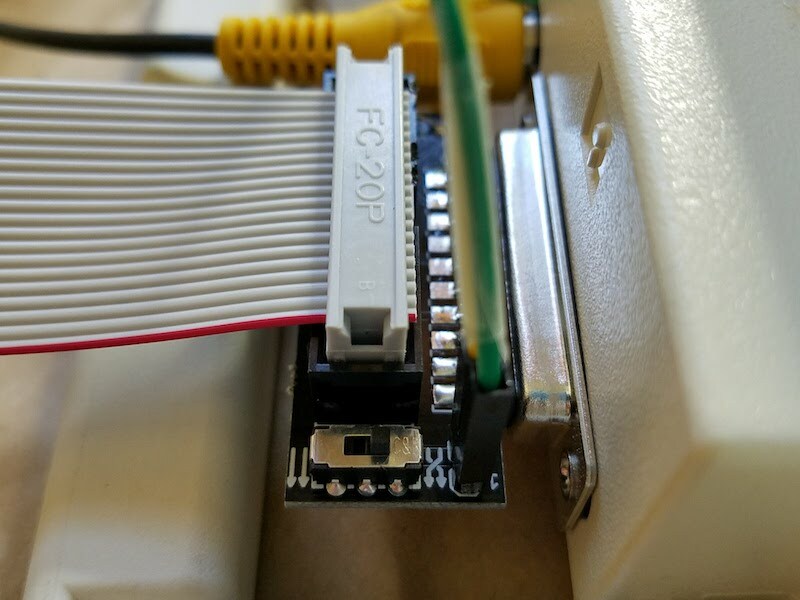 Finally, connect the Floppy Emu’s 20-pin ribbon cable to the switched DB19 adapter. All done! 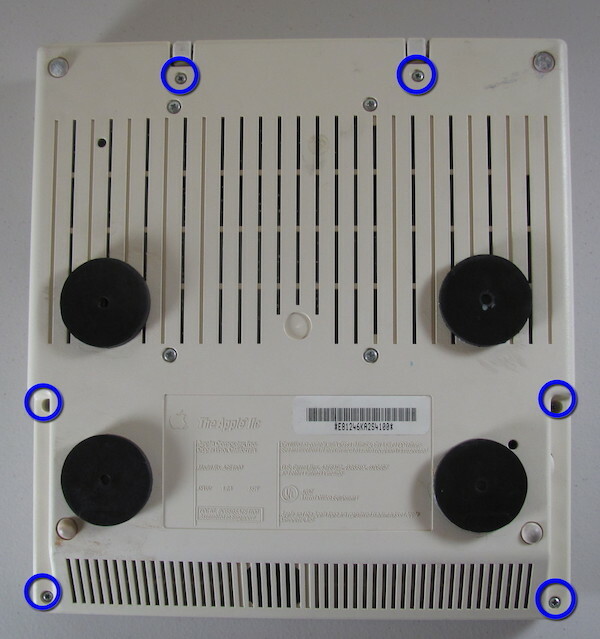 The two switch positions on the external DB19 adapter are labeled with icons. 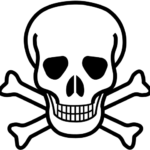 “Swapped” mode is the position with the icon of two crossing arrows, and normal mode is two parallel arrows. Assembly is in progress now. I hope to have more available for sale in about two weeks. 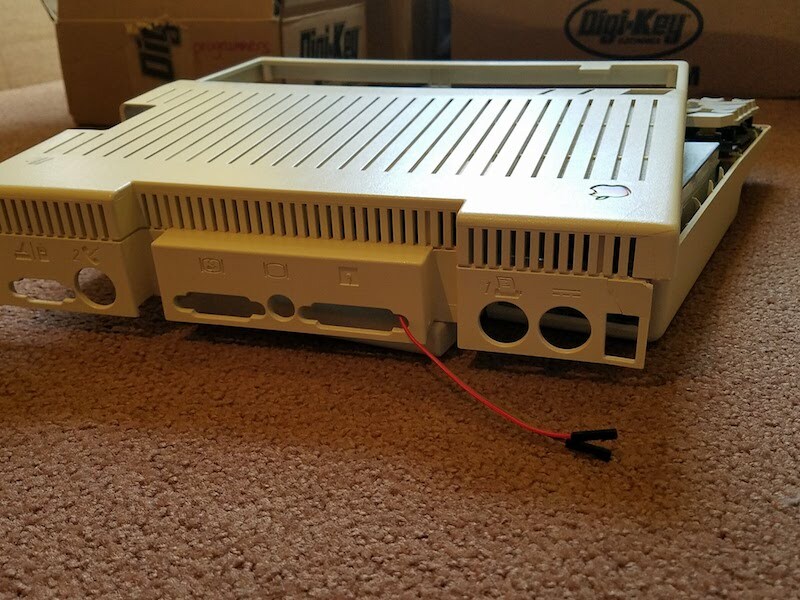 Interested/need to purchase one of your drive switchers for my Apple IIc+; do you have any available for sale? I expect more IIc switchers will be available in early to mid-April. I just picked up the floppy emu for my IIc It works fantastic. Thanks for your ingenuity Steve. I would also be interested in the switcher as well. More of these should be available in a few weeks. More stock is now available in the store. Hi, with this adapter you can use together the disk unit as well as the floppy emu.